The U.S. Senate is likely to vote next month on legislation that would help 28 million workers across the country and 21 million children. The bill would benefit more than a million workers in North Carolina and add more than a billion dollars to the state’s economy. And the latest polling finds that 73 percent of the American people support it. The legislation would increase the federal minimum wage to $10.10 an hour from the current $7.25 and restore some of buying power of the minimum wage that has massively eroded over the last couple of decades. You would think that the fate of a proposal that would improve the lives of tens of millions of people and that has overwhelming support from voters would be a forgone conclusion, but these are not normal times in the policy and political world. Common sense is a rare commodity. So too startlingly, is any sort of consensus that it makes sense to help people who are working hard every day and are still unable to take care of their families. Most of the opponents of raising the minimum wage are waging an ideological battle, not making policy arguments. Many of them don’t believe that we should have any minimum wage at all, much less raise the woefully inadequate level of the current one. They not only say the legislation to raise the wage is naïve and misguided, they call it immoral. Apparently following their blind and holy devotion to their self-created myth of a free market is far more important than making it easier for single parents who work 40 hours a week to feed their kids. The claims they trot out are as familiar by now as they are tiresome and wrong. Their most common claim is that most of the people who would benefit from a minimum wage increase are teenagers, many of them in middle class families, who are working for more spending money not to meet basic needs. The opponents of the increase really want to help the poor they tell us, but raising the minimum wage is not an effective way to do it. But almost 90 percent of the workers who would benefit from an increase are 20 or older with an average age of 35. Fifty-six percent of the workers who would stand to gain are women and almost a third of workers affected have kids. 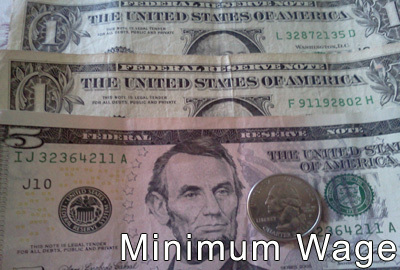 It is simply not true that an increase in the minimum wage would be an ineffective way to help the working poor. And it’s worth noting that the same people and think tanks in North Carolina opposing the increase also supported ending the state Earned Income Tax Credit that helped 900,000 low wage workers in the state. No matter how a policy helps people working in low-wage jobs, the ideologues on the Right seem to be reflexively against it. The other most common argument from the Right against raising the minimum wage is that it will result in an overall loss of jobs and they point to a recent report from the Congressional Budget Office as proof. But the majority of economic studies show little significant job loss from moderate increases in the minimum wage and a recent report from the Economic Policy Institute found that raising the wage would actually create as many 85,000 jobs because of the $22 billion increase in the GDP that would result. And isn’t it interesting, as columnist Eugene Robinson pointed out recently, that the same folks now falling all over themselves to cite the CBO study on the minimum wage refused to believe the CBO study that showed the economic stimulus they so virulently opposed actually created 1.6 million jobs? Maybe if they are against raising the minimum wage, they would support another public jobs creation bill. But that’s not their goal. It’s about ideology remember. And even if the CBO is right about job loss, the minimum wage bill is still worth passing. Economist Jared Bernstein points out that even using the CBO’s high-end estimates of job loss, 98 percent of the people affected in some way by increasing the minimum wage will benefit from it. Folks in Congress fretting about job loss could also take Robinson’s advice and work on a new stimulus plan or at least cancel the across-the-board sequestration budget cuts that the CBO says will result in the loss of 900,000 jobs. The bottom line is that millions of Americans are getting up every day and working hard and are still unable to make ends meet. Senators will have the chance to help them next month and they have a clear choice— holding a rigid ideological line or listening to the vast majority of voters and helping workers take care of their families. Let’s hope they make the rational, common sense, and compassionate choice.